Welcome to our website. Times Table is has been made to help you learning the multiplication tables from 1 to 100. Use the header menu or check the sidebar to navigate to the specific times table you are looking for. We have placed a button at the end of each times table so that each chart is a printable multiplication table. In addition, you can create a pdf or mail the post to a friend by clicking the button you find at the bottom of each multiplication table. We don’t know what term you have entered in the search engine and what brought you here, but we use times table and multiplication table synonym. Along the same lines do multiplication tables and times table mean the very same thing. For each number from 1 to 100 we have created the product up to 100, so that on our site you find the whole set of times table from one to hundred. In x times y = z x and y are called the factors, whereas z is the product of x and y. For example, in 8 times 7 = 56 eight and seven are the factors and fifty-six is the product of the numbers. In the near future we will also be adding multiplication table games and quizzes, along with useful tricks how to learn the times table without the need for memorizing each entry the table has. For now we only tell you a trick to learn the multiplication tables. 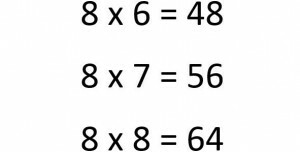 As the multiplications are symmetric you only need to remember that 8 times 7 is the same as 7 times 8 for example. This goes for any multiplication pair you find in our times tables. If you keep that in mind you only have to learn 50% of the multiplications. You may check the sidebar for the most popular times tables such as the 8 times table for example, which is the most sought multiplication table at the time of this writing. Feel free to drop us a comment. We appreciate any feedback you may have. In particular, we are interested in learning how you found us, and what content we should add in addition to what’s already there. About Times Table: The site has been created to help people learning the multiplication of natural numbers by heart, without the need for a calculator. As said we will add related games in the future, so please come back in the future. And, keep in mind that you can print each times table to study it when traveling to school and the like. If you find our site useful then please hit the like button and share the times table with your friends. BTW: This content is also available in Spanish: tablas de multiplicar.